Thanks to a local invention, lakeshore communities in the Philippines will soon begin using water hyacinths as an alternative source of fuel and organic fertiliser. "The world is badly in need of raw materials for biomass fuel that we can grow easily even in places that we don't expect," inventor Gonzalo Catan Jr told IRIN. The abundance of unwanted water lilies on the shores of Laguna de Bay - one of Southeast Asia's biggest fresh-water bodies - provided an opportunity for Catan to showcase his invention. The prize-winning technology recycles bio-waste into environment-friendly "green charcoal", a compact solid fuel providing a good alternative to liquefied petroleum gas for cooking and possibly industry. The technology works by using a "threader machine" to shred the water lilies. Next, enzyme-producing microbes are added and finally, the mixture of treated water lilies is put in the sun to dry. Organic fertiliser vermicast may also be produced from the lake's organic mud deposits but instead of microbes, earthworms are added to the mix. "Water the mixture twice a week and let earthworms eat them [hyacinths]," Catan explained. Catan said it was important to produce organic fertiliser. "That is the mistake of many countries, including the US. Production of bio-fuel goes now to feed cars instead of feeding cattle. Agriculture is also important," he said. Catan's company, Mapecon Green Charcoal Philippines Inc, was backed by the Department of Environment and Natural Resources (DENR) and local governments around Laguna de Bay. One of Mapecon's community partners is the municipality of Cardona in the province of Rizal. Cardona has eight island villages right at the heart of Laguna de Bay. According to one village chief, Balibago's Wilijandro Raymundo, the water lilies are especially abundant at this time of the year when the Amihan or cool northeast wind is blowing. "They are very thick. They grow as high as the human waist, and they are very heavy. They must be occupying 100 hectares of Balibago shoreline. It's almost impossible to pass through," Raymundo said. The water lilies will stay in Cardona's shorelines until April or May when the wind changes direction, Raymundo added. "Our residents will be able to benefit a lot once we begin producing green charcoal," Cardona's municipal planning officer Janet Ramos told IRIN. She said Catan had shown them an "improvised stove" fuelled by green charcoal instead of the usual liquefied petroleum gas. The vermicast will also benefit farmers and small-holders, she added. "We will look for a market for the products. That's part of our partnership. We will help in the marketing of the products that would be developed out of these otherwise nuisance plants," DENR secretary Lito Atienza told reporters during the signing of the agreement with Mapecon. Mapecon's project will also help the lakeshore residents simply by collecting the unwanted plants. Growing so tall and thick, the water lilies make navigation very difficult. "We cannot go out to fish. The water lilies are blocking our way. It's difficult for our people to report to school or to the offices on the mainland," Raymundo said. "You can't just push them out of the way using bamboo poles. They have big roots," Ramos added. As a result, travel time is doubled at this time of the year. The boats' engines are strained and more fuel is needed to reach neighbouring towns. 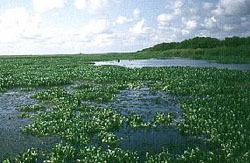 A report by the Laguna Lake Development Authority — the government agency tasked to protect the lake and its surrounding environmental resources — shows that the accumulation of water lilies on shorelines was causing poor water circulation, destruction of fish pens and fish due to the death and decay of aquatic plants, and increased water loss due to excess transpiration.